In India science and religion are never considered two separate things. All Indian Scriptures talks about science and spirituality at the same platform and these two are never compartmentalized. It is because of this reason we can see that Vedas are not just the Instruction Manuals for Spiritual Practices, but also a vast sea of knowledge pertaining to different fields of science and advance technology. How we can get rid of the circle of life and death? A Sadhaka (Spiritual Aspirant) is expected to get into the learning mode right from the beginning of his life, and should not wait till post retirement. As the answers to the above questions will not only enlighten our self with knowledge, but also eliminate all our fears and anxiety towards hardships of life. It helps us to live a better life without any fear while still manifesting excellence at personal as well as professional domains. Remember Teachings on Bhagvad Gita was given by Lord Krishna in the middle of the battlefield and not in any Ashram . It was given to a warrior prince, and not to a class of sages free from all duties and responsibilities of worldly life. It is because this knowledge is required to fulfill ones duties and responsibilities efficiently. This knowledge was required at the time of battlefield to take Arjuna out of his escapism, indecisiveness and to remind him of his ‘Swadharma” , his duty toward his kingdom. When even a warrior like Arjuna gets into dilemma and forgets his duties out of his fear and anxiety. Lord Krishna was available for his immediate counseling, and to put him into action. Lord Krishna is available for all of us in the form of our life. Our life teaches us a lot of things, provided we should be receptive enough to grasp the same and apply the same. The key to our happiness and success is our yearning for knowledge. There has to be a commitment to continuous learning which is translated as “Swadhyaya”. 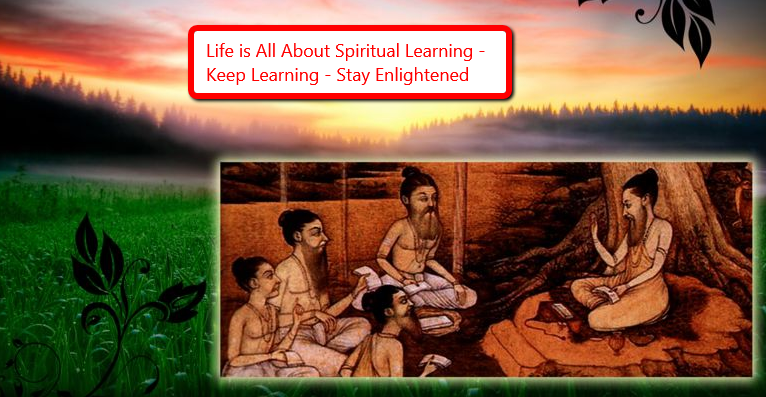 This continuous learning is modified to our overall spiritual development. We have to increase our power of perception and harness it automatically to enhance power of observation and inference – which are termed as one of the Valid Means of Knowledge as per Indian Scriptures. There has to be learning for self-development enhancing ones psycho physical energy system, clarity of vision leading to pure and strong & mind and a strong will. The person should be able to discriminate between right and wrong. Such a Vivek will be developed only by clarity of vision. Life present itself to us as a situation with alternatives, which we encounter on daily basis. We have to navigate through these alternatives and decide to choose any one after evaluation. Every alternative has to be assigned its own value. We must be in a position to have a very clear idea of the value of each alternative. After evaluating all the alternatives, one with highest value should be chosen to take forth. This is called Value Based Management also termed as Vivek Management. This, not only help us in keeping ourselves on a right path of Dharma but also in exploring deeper insights and discovering newer vistas in the process of learning and living life.